Bluefish fishing is incredibly popular in the northeast. Bluefish can be found on nearly every coast on the Atlantic Ocean. When they are very young, they are called snappers and are often to very first fish young anglers catch. Bluefish are very aggressive feeders and that makes them easy to catch. They are very tough fighters and a great challenge on light tackle. Bluefish can tolerate a very wide variety of water temps and salinity. By the time they reach two years old, bluefish are ready to start breeding. They rarely get larger than 20lbs (a bucket list fish). 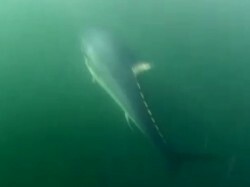 There are countless bluefish fishing techniques as they can be targeted on almost any tackle. Bluefish eat a variety of small-bodied animals such as shrimp, small lobsters, crabs, larval fish and larval mollusks, but lets be honest here, bluefish will eat anything. I’m sure if I made a plug out of a beer can they would hit it. Adult bluefish are opportunistic feeders, commonly focusing upon schooling species such as menhaden, squid, sand eels, herring, mackerel, alewives, scup, butterfish and cunners (basically everything). Bluefish generally feed in schools, actively pursuing prey in tidal rips or in inshore shallows where food in easier to catch. The feeding behavior of this species is legendary! 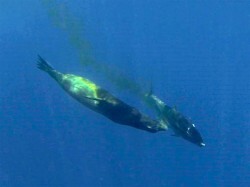 Bluefish are reputed to dash wildly about within schools of prey, absolutely marauding them. I can recall drifting live bunker in the back a bay in late august three years back and had a bluefish attack my bunker and watched blood shoot 2 feet in the air, it was amazing to watch this bluefish destroy my bunker and eat completely around my hook, bit the head and body off and and took the tail off leaving a half dollar sized chunk sitting on the hook…but what a show! They frequently drive schools of prey species into shallow inshore areas (such as the back of bays) where it becomes easier to cripple or catch fish that are trying to escape. Reproduction: Bluefish spawn between June and August. Spawning occurs primarily offshore, over the continental shelf when water temperatures warm to between 64 and 72 degrees. After hatching, the larvae move towards surface waters and are swept along the continental shelf by different current current. Most females produce about 1,000,000 eggs per year. Bluefish fishing can be easily be done from a boat or on shore. Wire leaders are a essential to successfully catching these fish, their razor sharp teeth are capable of cutting even 80lb Fluorocarbon leaders. Anglers use a variety of plugs, sand eel type jigs, squid or mackerel like lures when casting or trolling. Pogies (bunker), mackerel or eels are the preferred live baits. When these are not available, many types of cut bait also work. The summer bite in the western Long Island Sound gets into full swing around mid July. The numbers of fish have increased steadily over the past several years. The amazing amount of bait, especially spearing and baby bunker, have certainly played a factor. Light tackle enthusiasts can count on getting into as many fish as they want until their arms get tired. No matter what the conditions, there is always somewhere to fish in the protected waters of the western Sound. Most of the locations are within sight of the Manhattan skyline and only minutes from New York City. The bluefish bite is at its best at dawn or dusk and any other time when there are low light conditions (such as an overcast day). There is so much bait around that the bass simply wait for the most optimal ambush conditions for their daily feed. They are almost always found on shallow water structure, including rock piles, docks, and grass lines. As the sun gets high, they still hold in these locations, but are usually very reluctant to feed. The bluefish are much more aggressive and can often be found blitzing bait under the midday sun. When they are not blitzing bait, they school up in staging areas and can be easily convinced to bite. 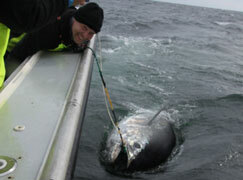 The blues can be found in any depth and in almost any location where there is bait in the vicinity. They will frequently shadow a school of bait for a period of time and then suddenly make their attack. The resulting commotion will get the attention of every seagull within sight or earshot. A good moving tide can certainly improve the bite, but it is not unusual to see the fish feed right through the slack or flood. The birds are a valuable tool when bluefish fishing. The birds can either by high flying, bee lining, screaming, wet roosting, or dry roosting. The angler needs to understand the implications of each of these behaviors. High flying birds typically circle repeatedly above a rather large patch of water. This is a sign that baitfish are concentrated beneath the surface of the water and out of their reach. They can easily cover a large area from well above the surface and they are waiting for predators to drive the bait to the top. It is very import for the angler to not have tunnel vision when working an area. Many times the fisherman’s concentration is on a small patch of water that the fish recently occupied, when just over their shoulder a full scale blitz is going on. Watch for birds flying relatively low over the water in a straight line. Several birds all heading in the same direction are probably making a bee line towards some obvious surface activity. When there are lots of birds over relatively wide area, the best thing to do is to listen for their screams. When bait appears on the top, they cannot contain their excitement and immediately give away the location. Large numbers of birds sitting on the water in an area is a sign that some significant feeding activity recently took place. The bait has probably gone deep and may be directly beneath them. The bass and blues may be nearby and simply taking a breather. A big flock on the water bears watching for a least a few minutes. A large number of birds roosting on rocks or docks suggest that there is probably a very large bait source in the area, but nothing has happened for quite some time. This may be worth revisiting later in the tide. Light spinning or bait casting tackle will provide the most sport and enjoyment. Even though there are plenty of chances to catch some very big stripers and there are always big blues, a good 6’6’’ to 7’ medium weight, fast action is enough to handle nearly anything. Braided and gel spun lines are perfect for this type of fishing. The thin diameter and slippery surfaces allow for long casts even with some of the smallest lures. The lack of stretch transmits every twitch of the rod directly to the lure and the angler can create some very enticing retrieves. Most pros prefer 20lb test as it has enough strength to handle some of the biggest fish and larger plugs, yet a thin enough diameter so that there is adequate line capacity in most suitable reels. A top quality reel with a good drag is a must. A big bluefish or bass will definitely put the tackle to the test. The rod must strong enough to handle throwing up to a 7inch (2oz) plug. Matching the size of the small baits being pursued is very difficult and unnecessary. These fish are attacking out of impulse and are drawn by the noise and commotion. A noisy 5-7inch surface plug is most effective. Smaller plugs limit casting distance and make much less commotion. The fish are not intimidated by the larger plug size. Even the smallest bass and blues do not hesitate to attack a plug which is only half their size. All plugs should be tied to a 2-3ft length of 30-50lb Fluorocarbon leader attached to the main line via a small Mustad Rolling Swivel. 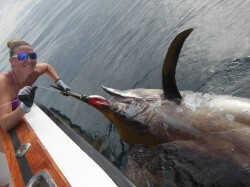 The leader will aid the angler when handling the fish at boat side. Never handle the braided line, the thin diameter and unyielding edge can easily cut you. Popping plugs such as surface cruisers and pencils are usually the most productive. However, these lures take a certain degree of skill and practice to achieve a good presentation. Sometimes it is better to work a flat and angling face popper with a perfect presentation, rather than a surface cruiser in a mediocre presentation. The advantage of the cruiser and pencils is that they have a lot of action with very little forward momentum. This means that the plug stays in front of fish for a longer period of time and really gives the fish a chance to home in on it. It is hard to maintain a steady retrieve when a fish is swirling behind the plug or striking and missing. When bluefish fishing the angler must resist the temptation to strike back at the fish until it is certain that it has the plug. Many times a fish will strike at a plug repeatedly and not get hooked. Simply maintain the same retrieve that got the fish’s interest in the first place, or stop the retrieve just for a moment to make the lure appear like a stunned or wounded baitfish. Start the retrieve again with just a slight twitch and the fish will usually strike again. If there are no takers during the course of a long retrieve, vary the speed to see if the fish are interested in a slightly different presentation. Slow retrieves are usually more effective as the fish have a much better chance to find the plug. Once the fish does have the plug, a short hook set is usually enough to ensure that it will make it to the side of the boat.